The scientific name of this orchid - ericetorum - refers to the fact that it is frequently associated with heather. In Britain it is more commonly found in western parts of the country, and we have seen and photographed this orchid in West Wales and in western Scotland where Cross-leaved Heath Erica tetralix is very common. This subspecies of Dactylorhiza maculata is more particular in its habitat requrements than Heath Spotted-orchid, which will sometimes occur on more alkaline substrates along with the Common Spotted-orchid Dactylorhiza fuchsii. This territorial cross-over can create difficulty in accurate separation of Heath Spotted-orchid from Common Spotted-orchid.Dactylorhiza maculata subsp. ericetorum, in contrast, occurs only on very acidic substrates so there should be no chance of it being confused with Common Spotted-orchid - although there is still the distinct possibility of confusion when trying to separate it from the more commonly-encountered Heath Spotted-orchid. The main differences between Heath Spotted-orchid and Dactylorhiza maculata subsp. ericetorum are that the leaves of the latter are somewhat narrower and more sharply pointed and the flower lips are marked with dots and streaks rather than with loops. 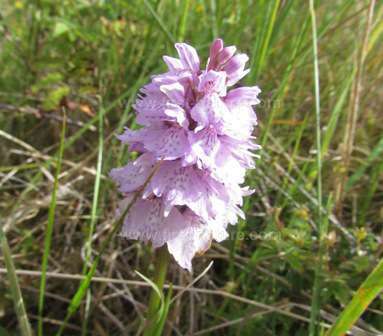 This orchid is reported throughout western Europe, but it is possibly more common in parts of Britain and in particular in West Wales and western Scotland. 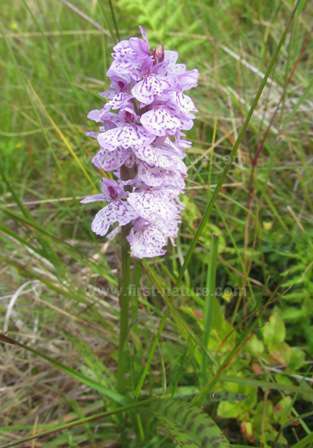 Peat heathland, of which there is so much in Scotland in particular, is a very good place to look for this orchid, but do beware of the midges, which reach their peak abundance at the same time as this orchid and inhabit the same places. The flowering season of Dactylorhiza maculata subsp. ericetorum is later in the far north of Scotland than in West Wales. In Wales it can be seen in flower from June onwards, but in Scotland a visit in late July and August is a better bet for finding this orchid. The specimens shown on this page were photographed in the far north west of Scotland during mid August.